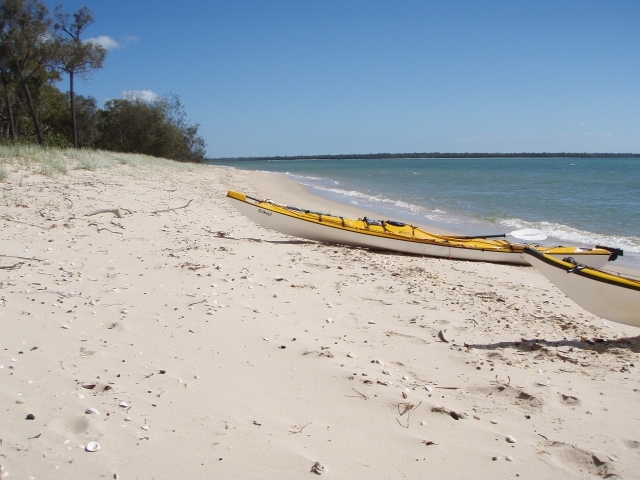 Fun police regulations and a forecast SE of around 20 knots lay waste to initial plans for camping in the Woodgate National Park over the Easter long weekend. Left on our pat malone Mark and I shared a series of day paddles with the luxury of returning to a comfortable bed and an expanding waist line courtesy of Mark's Mum's home cooking. 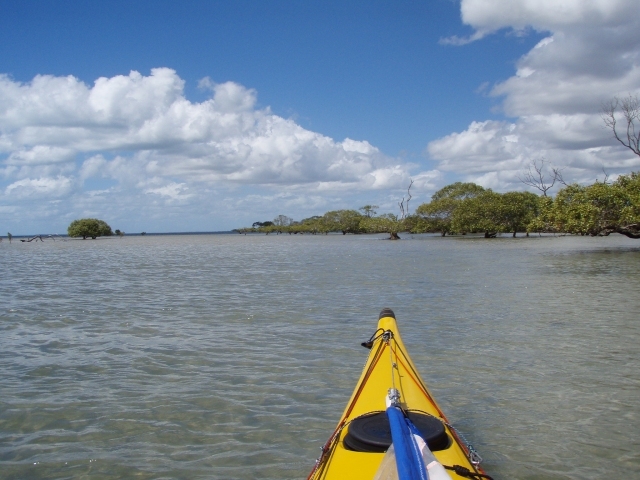 Having paddled direct from Torquay to Burrum Point we wanted to take a closer look at the coastline of the Burrum River National Park. The beaches were sandy and while there were a couple of places that looked inviting, there is no camping here. Equally no camping on the adjoining private property with signage to suggest you would be shaking off a savage dog or worse. A helicopter buzzed up and down with a photographer hanging out the side. He appeared to be taking photos of newly staked out land. When were in line with the subdivision the chopper came in very low. The picture might need the touch of an air brushing for a more saleable greeting. Marsh Creek, a couple of Km south of Toogum had a very shallow wide entrance even on the top of the tide. 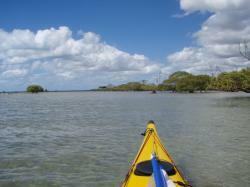 This gave way to a sandy bank on the left before morphing into a primeval muddy creek surrounded by stunted mangroves. An ideal hangout for crabs or a croc. The speed and distance the tide retreats in this area can result in a protracted port if you get it wrong. We only just scooted across the sandy banks into the main stream of Beebli Creek to have lunch under the shade of the cassurinas on the southern bank. This was topped off by a slow slog 300m against the tide for a scrummy coffee at the restaurant overlooking the boat ramp. About a third of the way back we saw some large dark indistinct shapes in the water. Next we were surrounded, by a herd of dugong. Around 10 to 15 adults bobbed up and down and did not appear to be perturbed by our presence. Strange thing is that we never saw so much as a blade of sea grass. With an outgoing tide and an easterly blow it was a quick trip back under sail averaging 9 - 12 kph.